The Clean Show has arranged special discounted rates and amenities at a variety of New Orleans hotels during Clean 2019. Some hotels are designated headquarters for each of the show’s sponsoring associations: ALM, CLA, DLI, TCATA, and TRSA. However, all Clean Show participants may stay at any headquarter or general housing hotel. 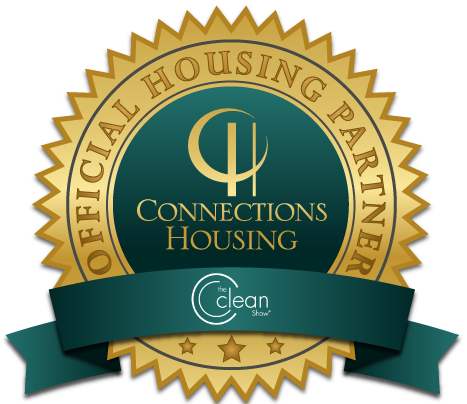 Clean 2019 has designated Connections Housing as the only housing provider for the show. There are fraudulent companies and organizations that will try to present themselves as official partners of Clean and offer you a potential room that might not be guaranteed or available. Should you be contacted by someone other Connections Housing, please let us know by emailing cleanshow@connectionshousing.com. Click here to view the Clean 2019 Hotel Locator Map. Per-night room rates shown are for single or double occupancy at most hotels. The rate may be slightly higher for three or more people in a room. Please contact Connections Housing for suite rates. Hotel rates do not include local taxes. A credit card is required to guarantee your room until arrival. Reservations canceled within 72 hours of arrival will be charged a penalty equaling first night's room and tax. The hotel also reserves the right to charge an early departure fee if applicable. If you are unable to provide a credit card you can secure a room by mailing in a check. Please contact the Housing Bureau for detailed instructions. Complimentary shuttle bus service to and from the Morial Convention Center is provided for headquarter hotels. All other Clean 2019 hotels are within two blocks of a shuttle pickup point. Exceptions are those hotels within walking distance of the convention center. Shuttle bus service is only for participants staying at one of the official hotels. Attendees with special needs staying at an official hotel not directly picked up by shuttle service can call the shuttle company for assistance. (a) Online reservations, please use the booking links on the left side of this page. (b) Telephone reservations call 1-844-216-0057 or 702-675-6584 for calls outside the USA. (c) You may also send a printed hard copy of the housing form by mail or facsimile for Room Requests of less than 10 rooms. Click here to download a copy of the housing form. (d) Exhibitor and Attendee groups requiring 10 or more rooms may choose to submit an online block request by clicking here. Why Book through Connections Housing? You may be able to find lower rates at official Clean Show hotels by booking through other services, but you may not get the same product in return. Show Management has contracted with all of the official hotels so we may offer Clean 2019 exhibitors and attendees quality hotel room options, enhanced reservation protection, and special amenities at a great price. Booking though the Housing Bureau also provides a history of room usage that is important in negotiating low rates for future Clean Shows.